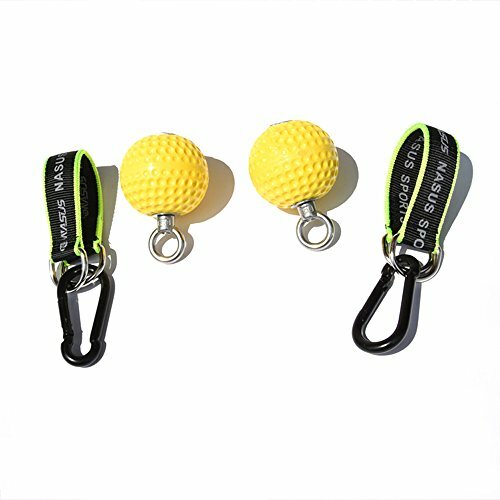 The Power Balls are the ultimate training tools for working grip strength while doing pull-ups. The 3″ diamiter balls provide a radius for open hand training, and are ideal for smaller hands. .From pinch strength to core exercises the Power Balls provide more advanced rock climbing training options than your standard hanging tools. Sold in pairs. PRACTICAL | Fun, safe, durable, open-hand design. Muscles tendons lay ergonomically & train efficiently. Excellent to add into your workout routine. CHALLENGING | Spherical shape increases forearm and grip strength, boosting endurance. A must have for rock climbers, extreme sports Ninja Warrior or SASUKE players. SIMPLE TO USE - An excellent addition to your workout routine. Switch between pull-ups and chin-ups without ever letting go. Easy to setup and use, and it's insanely fun to be on.